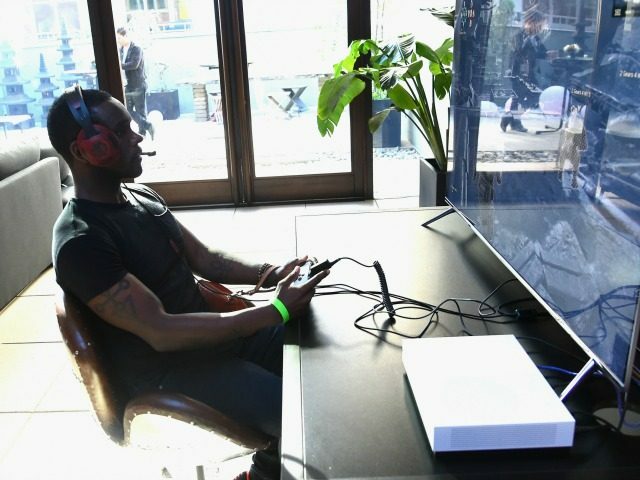 The International Classification of Diseases, published by the World Health Organization, would define “Gaming Disorder” as a “persistent or recurrent gaming behaviour (i.e., ‘digital gaming’ or ‘video-gaming’) characterised by an impaired control over gaming, increasing priority given to gaming over other activities to the extent that gaming takes precedence over other interests and daily activities and continuation of gaming despite the occurrence of negative consequences.” In other words, a lack of self-control regarding video games is being legitimized as a specific mental illness. Concerns about problematic gaming behaviors deserve our full attention. However, we claim that it is far from clear that these problems can or should be attributed to a new disorder. 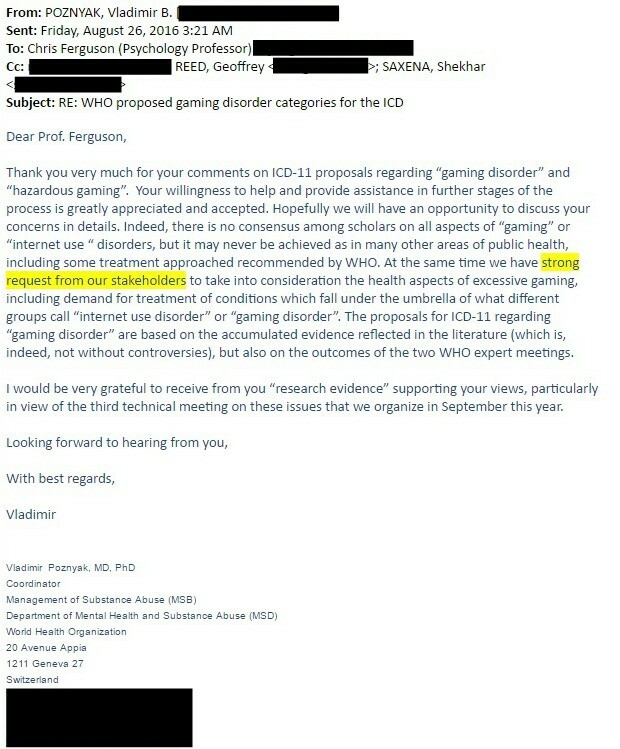 The empirical basis for a Gaming Disorder proposal, such as in the new ICD-11, suffers from fundamental issues. Our main concerns are the low quality of the research base, the fact that the current operationalization leans too heavily on substance use and gambling criteria, and the lack of consensus on symptomatology and assessment of problematic gaming. The act of formalizing this disorder, even as a proposal, has negative medical, scientific, public-health, societal, and human rights fallout that should be considered. Of particular concern are moral panics around the harm of video gaming. They might result in premature application of diagnosis in the medical community and the treatment of abundant false-positive cases, especially for children and adolescents. Second, research will be locked into a confirmatory approach, rather than an exploration of the boundaries of normal versus pathological. Third, the healthy majority of gamers will be affected negatively. That conclusion might be seen as mere conjecture if not for correspondence between Dr. Ferguson and Drs. 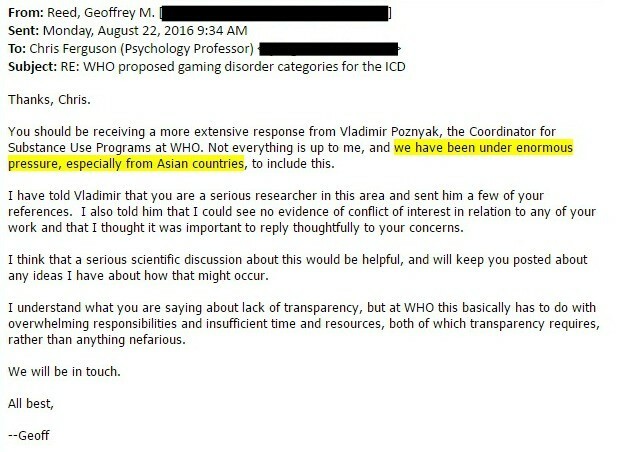 Geoffrey Reed and Vladimir Poznyak, both involved in the drafting of ICD-11, specifically noting “enormous pressure, especially from Asian countries” and “strong request from [WHO] stakeholders” to include this definition of Gaming Disorder. Drs. Reed and Poznyak did not immediately respond to a request for comment from Breitbart Tech. The classification could have negative effects across the world, especially where labels of mental illness could rob someone of their rights. Imagine if having Angry Birds installed on your smartphone was enough of an excuse to mandate attendance at a “treatment camp,” and you’re starting to get an idea of how this could go very wrong, very quickly. Many of the “symptoms” proposed (particularly for the DSM version) are kind of normal stuff that many studies suggest aren’t really good predictors of problems. There’s also data suggesting the whole concept of “video game addiction” isn’t really stable and tends to go away by itself over time without treatment. The concern lies in the history of using classifications of mental illness as a weapon against groups and individuals by countries’ governments. Over 6,000 people in China — most of them teenagers — have been treated with actual electroshock therapy just because they were thought to have used the Internet too much. China also has a long history of committing whistleblowers and other dissidents to psychiatric “care” for the crime of disagreement. 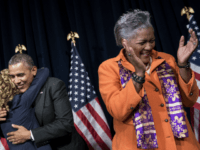 The subject is extensively covered in the 2002 book Dangerous Minds: Political Psychiatry in China Today and Its Origins in the Mao Era, published by Human Rights Watch. the Soviet Union, mainly between 1970 and 1990. But lest you think that more open societies are immune to this insidious form of manipulation, consider our own messy history of psychiatric abuse. In 2010, a police officer was involuntarily committed to a psychiatric ward for attempting to reveal what he said was the truth about falsified crime rate statistics. He was eventually paid $600,000 in a settlement by the City of New York after filing a $50 million human rights violation suit. Our foster care system stuffs victimized children full of psychotropic drugs in a thinly veiled attempted to make them easier to handle. Schizophrenia was allegedly used to deliberately hamper the rise of civil rights. Barry Goldwater was publicly crucified for his conservative views by a team of psychiatrists who disagreed with him politically; the Goldwater Rule still exists because attacking someone’s mental fitness is such a potent weapon. In supporting diagnoses that are nebulous and unproven, the World Health Organization is giving its tacit approval of an arguably unscientific diagnosis with endless potential for abuse around the world. At best, it could be an easy platform upon which to medicate individuals instead of identifying actual behavioral issues. At worst, it could be one more tool — easily applied to just about any connected citizen — for silencing the inconvenient. Follow Nate Church @Get2Church on Twitter.